Next week, hundreds of Internet technology and policy experts will gather in Paris for the World Summit on the Information Society (WSIS), where they will discuss and debate some of the most pressing Internet policy issues of the moment. The conference will mark the tenth anniversary of an ongoing process through which various UN agencies have worked together, alongside industry, governments, and civil society, to develop goals for global ICT development and Internet governance. 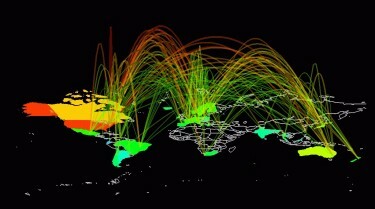 Global Internet traffic map by Joana Breidenbach. Approved for reuse. The WSIS process has been driven primarily by the International Telecommunication Union (ITU), the UN agency that ignited controversy during its treaty conference last December where several governments put forth sweeping Internet security and access measures that could have severely threatened rights to free expression and privacy online. While the most troubling treaty proposals did not pass, the conference left many Internet rights advocates concerned about the intentions of certain ITU member states. It is now clear that some governments see the ITU as an apt vehicle for imposing international Internet regulations that could lead to greater government control over Internet users’ rights. 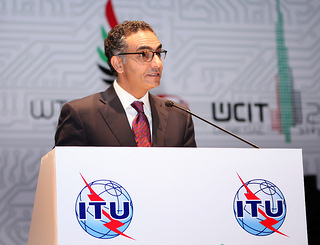 ICANN CEO Fadi Chehade speaks at the opening ceremony at WCIT 2012, courtesy of Flickr user itupictures. Unlike the December conference, which was largely closed to the public, and allowed only limited participation for civil society groups, the WSIS is intentionally open to participation by all stakeholders. 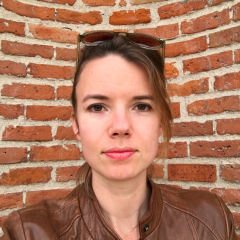 Global Voices Advocacy will benefit directly from this structure, as three of our staff — GVA Director Hisham Almiraat, GVA Editor Ellery Roberts Biddle, and Global Voices’ Northeast Asia Editor, Oiwan Lam — will participate in the meeting. We’re looking forward to joining this global dialogue and offering our perspectives (and those of our community) on the policy challenges that affect bloggers, tweeps, and online activists every day. We’re not just treating this as another conference — in fact, we see our participation in the meeting as a manifestation of one of the core commitments of the WSIS process, which is to truly consider the interests of all entities that hold stake in the Internet, including users. While policymakers often wax about the importance of including citizens or users in Internet governance-related processes, this does not always translate to real participation. While some policymakers may not have users’ interests at heart, others may genuinely want to incorporate user input. But this is no simple task: how do you evaluate the infinitely diverse range of opinions and ideas online in order to incorporate them into a policymaking process? We believe that the Global Voices network provides a strong platform for exactly this kind of information-seeking. As an international network of Internet-savvy bloggers and citizen journalists, we find that our community often holds strong and well-informed opinions about Internet policy issues. Our hope for this conference and for our work ahead, is to find unique, participatory ways to voice these ideas in forums where we can have a real impact. We’re honored to be participating in the WSIS and eager to do our best at representing the interests of our community and rights-conscious users around the world in doing so. Please feel encouraged to use the comment field below to share your ideas and concerns about global Internet policy issues — we will do our best to represent these concerns at the WSIS! Thanks you for the invitation to participate and to the quality of the post. In the post, you have made reference to many things(Internet security, freedom of speech and online privacy). All this ideas around the users, the willingness of governments(UN) and the role that could play Global Voices Advocacy. One of the ideas that justify the GVA is the struggle against censorship on the internet. We can therefore, reflect to: the transparency reports, open source, copyright, defamation, the disabled, the allocation of scarce resources, the solutions of disputes, the use of IP applications such as HTTP, http://FTP... But above the e-government as against the rights of the users. The conference is importante for the growth of IP networks, such as the internet and its convergence with other networks. Like the rapid host, it has a voice over IP(VOIP); as the impact of the next generation of networks(NGN) in the policies and regulation of ” distributed products”. We hope from this, everyone will enjoy new digital opportunities. And it will also help the capacity building of developing economies. In conclusion I think that the GVA should participate as advisor in the World Summit on the Information Society (WSIS), because GVA has the information, the orchestration and the technique. Besides legitimacy GVA is closer to the global organization of citizens on the network users. No doubt that our partners will create a greater awareness among decision makers of the user rights , and I wish for them and our global network a successful overall.